What a fantastic weekend of swimming and sports. Thank you to all participant young and old, slow and fast. It is all of you that make the CLWF a special event. There are too many events to list individually so here is a spread sheet with various events listed. Click on the tab at the bottom of the spreadsheet to see your event. 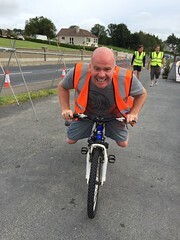 Keith Garry kindly wrote the below race report for the 5km swim on Sunday. 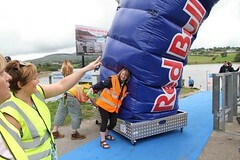 The Big Guns are kept for the final day at the Camlough Lake Water Festival. After a morning of shorter swims for the kids and sprinters the weekend’s final events are the 5 & 10k swims. 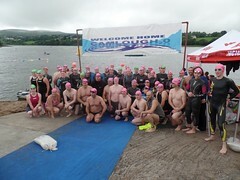 It is open to skins and wetsuit swimmers from all over but it also incorporates the Ulster Championships. 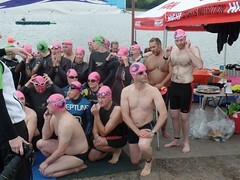 The Saturday evening hosted the traditional Lord and Lady of the Lake event a 2.7km swim. Many of the participants were the same so going into Sunday’s event you knew who the competition was. The previous evening I was able to cut a few corners and knew the best line to take on the lake to give me an edge and now any advantage gained from being a local was lost as the course was the same. The weather and water conditions were perfect. After the horrendous down pours through the night and morning the lake was flat calm and the rain had stayed away. For the start of the 10k there was a lot of banter as local swimmer and 10k defending title holder Bill Donnelly was nowhere to be seen. 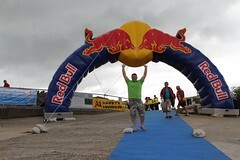 Ian Conroy even checked behind the registration marquee to see if he was going to make a dramatic last minute entry. Bill did not show for the 10k but did appear for the 5k this year. 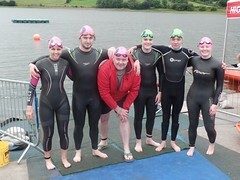 The 10k started with 5 swimmers in a mix of Skins and Wetsuit some taking on a 10k for the first time ever. Many 5k participants turned up early to cheer them on their way. 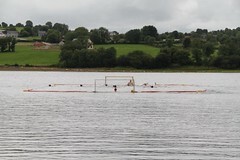 The course was a 2.5k loop, 4 laps for the 10k swimmers and 2 laps for the 5k with a feeding station near the startline to allow the spectators to roar encouragement as they quickly stopped. 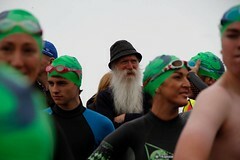 The crowds began to build as 50 plus swimmers in skins and suits were registered. 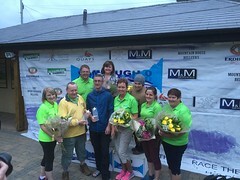 The banter had started as many were the same line up from the Lord & Lady of the lake swim last night and there were some very strong junior and seniors from Limerick, Dublin and Belfast. 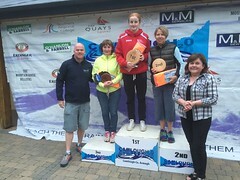 Gone are the days when the CLWF weekend was primarily local swimmers and I knew a podium place was guaranteed. It is certainly great to see such high calibre swimmers in attendance. So the slipway was full of nervous excitement as the competitors eyed each other up and were pointing out lines to take on the course as well as the first timers who were nervous taking on their biggest ever swim. The event briefing was held by Padraig Mallon who explained the course, safety and rules for the skins swimmers. 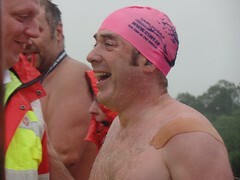 There were a few giggles when he declared all wetsuit swimmers cheaters. 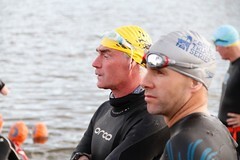 We were then counted into the water by the safety team and made our way to the start line. Scanning the start I could see two strong juniors from Limerick and Olive Conroy shoulder to shoulder on my right and just a small stretch to my left was John Callaghan and some of the strong Belfast swimmers. 3,2,1 and the Claxton marked the start by Particia McParland. It was a very short distance to first buoy maybe 100m and there was a fight for clear water. On several occasions I felt the force of a full body on top of mine, my hands connected with peoples head and shoulders as I desperately tried to find clear water to allow me to take my next stroke. People were colliding with me and on a breath to the right I could see 4 swimmers shoulder to shoulder with me with no clear water in between. It was the same on both sides and I then decided to take a slightly wider angle around the buoy in order to not get tangled up in a sea of bodies that were rounding the buoy. I think it was a good move as it looked like mayhem in there and I was also able to conserve some energy in the clear water slightly to the right. The next Buoy was approx. 500m away and over the distance the pack started to find its groove There were 4-5 people out in front that included the young swimmer from Limerick who was now in skins and then a second pack that I was in that included another junior skins swimmer. The pace was strong but had settled from the initial panic. We still bumped shoulders occasionally but it was easy to find clear water. As we neared the next buoy cramp struck on my foot and a quick stop to massage it cost me a couple of places but I quickly got back on track unfortunately two of the pack had moved ahead of the other 3. We picked off a couple of wetsuit swimmers who perhaps started to fast and were now slowing. I picked my line down the length of lake and settled into my stroke. We were now a pack of 3. It was steady swimming as we headed down the lake. As I turned the buoy at the far end I decided to try and up my pace a little and found myself getting into clear water. 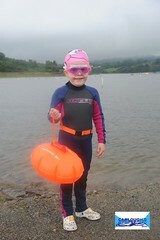 The water conditions were perfect with hardly a ripple on the water and I settled down and started to enjoy the swim. Half way back on the first lap I passed Michelle Brooker who was competing in her first ever 10k and waved some encouragement as I passed. I then took a tight line to the shore to round the 2.5k mark near the start line and headed back up the lake. I could see the lead pack heading back around and knew there was no chance of catching up. As I rounded the 2.5k marker I could see the other 2 that were behind me and I was starting to break clear. I decided to stick with the same pace as this should allow me to slowly pull away further. As I headed back down to the corner buoy I could see a big pack of 10-15 swimmers that had both wetsuits and skins it looked like they were having a good race no doubt pushing each other on. 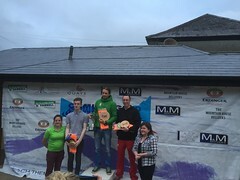 I managed to maintain my pace for the remainder of the race and came home 1st male skins and crowned Ulster 5k winner. A satisfying result on the anniversary day of my English Channel solo swim despite a lack of training! When I got back the other competitors told me that the lead pack was very competitive with an exciting finish. 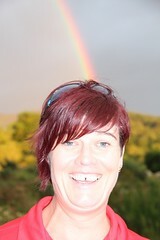 All agreed that the event was a great success and enjoyed by all. 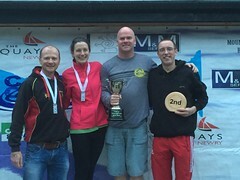 What a great weekend of open water swimming as I gained the title of Ulster Champion and Lord of the Lake as well as being a buddy swimmer for my 7&8 yr old boys in their first ever aquathon and junior Try a Tri. 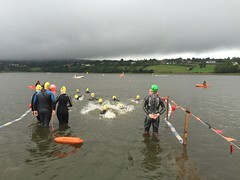 Other events that the CLWF team hosted over the weekend included a night swim with over 100 people taking part, Irelands only Open Water Waterpolo and a series of junior and sprint distances all on Camlough Lake. Thanks to; Infinity Channel Swimming (http://infinitychannelswimming.com/ ) for Sponsoring the 10k, Chillswim for providing some prizes (www.chillswim.com ) M&M Services for rigging up the temporary hot showers that were a welcome sight all weekend and of course the CLWF committee and volunteers.